Invention and Innovation -- What's Behind a Good Idea? Originally broadcast during roughly the equivalent of two TV seasons from 1992-1994, The Young Indiana Jones Chronicles alternated between a nine-year-old Indy (Corey Carrier, Nixon) and a teenage Indy (Sean Patrick Flanery, Powder). The tales of the younger Indy primarily revolved around his globetrotting journeys with his father, Henry Jones, Sr. (Lloyd Owen, Miss Potter), on a leave of absence from Princeton while the professor toured for a series of speaking engagements and meetings around the world. The older Indy managed to get into plenty of trouble in Mexico, Ireland, and Europe, where he joined the Belgian army during World War I before heading back to the States for more adventures. When released on VHS, George Lucas reorganized the adventures as feature-length movies presented in chronological order and snipped out awkward bookend segments featuring George Hall as a nonagenarian Indy. That same format is followed here and it’s a strategy that works well. The features are typically two episodes seamlessly weaved together and there are no obvious commercial break-induced moments of high drama or obnoxious musical cues. It could have been a pretty simple and quick matter to transfer the complete series to DVD. Fortunately, Lucas has taken a much more challenging route, one befitting the eminent archaeologist. Packaged as The Adventures of Young Indiana Jones: Volume One, this box set can take its rightful place next to The Adventures of Indiana Jones, the DVD box set of the original Harrison Ford trilogy. Volume Two will hit store shelves in December and the third in May, at which point the fedora will be returned to Ford as his fourth adventure, Indiana Jones and the Kingdom of the Crystal Skull, marches its way onto the big screen. While the best way to learn history is by traveling to where it all happened and soaking up the sights firsthand, the next best way is to travel vicariously through Henry Walton Jones, Jr. This set fulfills the latter option with an amazing amount of flourish. Back when the series first aired, the episodes with Sean Patrick Flanery as the teenage Indy were generally greeted with more anticipation than the nine-year-old’s stories, which were expected to be skewed to an equally younger crowd. Well, happily, all the episodes have aged very well. The younger one’s adventures are as highly entertaining as the teenager’s and they’re all buoyed by a fantastic menagerie of historical figures. While the point of the series is to present history in an easily-digestible fashion, going into the shows with some knowledge of the subjects and people being presented actually makes these adventures much, much more enjoyable. Sometimes the stories focus on the genteel, as when teenage Indy’s major preoccupation is fixing his girlfriend’s Bugati so they can upstage the local jock at the prom. His girlfriend is the daughter of Edward Stratemeyer (the creator of Tom Swift, the Hardy Boys, Nancy Drew, and the Bobbsey Twins). Indy eventually gets automotive assistance from another New Jersey resident, one named Edison. Yes. Thomas Alva Edison. Well, to spice things up, there’s also drama involving some stolen plans for a new-fangled invention. The adventures typically meld story with substance, as when Indy comes down with Typhoid Fever in China and it becomes an opportunity to learn about acupuncture. Other gems include Indy’s encounter with T.E. Lawrence, an Oxford student touring around Egypt by bike after documenting Syria’s crusaders castles. The chap liked to be called Ned. And he’d go on to become known by his “professional name,” Lawrence of Arabia. In a nice salute to detail and continuity, the teenage Indy continues to correspond with Ned as their individual adventures begin to escalate. The affection Lucas has for Indy is obvious and contagious. In bringing Young Indy to TV, he corralled plenty of top-tier talent that in Volume One alone includes Frank Darabont, Mike Newell, Bille August, Max von Sydow, Vanessa Redgrave, and Lukas Haas. Lavishly mounted and presented with pacing that fits the individual story, the series feels more like something found on PBS or the BBC. But, surprisingly, this homage to culture, travel, and language was originally aired on ABC. Some might find this fairly whimsical take on history too preposterous. After all, Indy runs into a veritable who’s-who of history during his travels. Freud, Picasso, Puccini, Roosevelt, Churchill — all play a role in this first volume. But is such a thing all that ridiculous? Not at all. Concurrent with this series being aired on ABC, young Mattopia Jones spent 10 months living in London and traveling around Europe. Along the way he had his own fantastic adventures and cultural renaissance. To name only a few of the highlights, he saw U2 (and was served more than a few perfect pints) in Dublin; had Andrew Lloyd Webber sitting right in front of him during a preview of Sunset Blvd. in London’s West End; followed in the footsteps of T.E. Lawrence by visiting his various English residences; basked in Princess Diana’s radiance; caught a glimpse of the Loch Ness monster; spotted a director named Steven Spielberg at the premiere of Schindler’s List in Krakow, Poland; sat on a couch in Freud’s house; and was even held hostage (briefly) in a leather tanning facility in Marrakech. History is happening. Yes, even today. Culture, adventure, and high drama are there for the taking as long as one takes that first step out the door. Jeepers creepers! This set is a treasure trove of historical goodies. 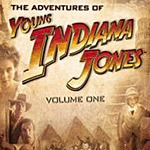 Overall, there’s more than 30 hours of programming to be had and only 11 of those hours are the Young Indy adventures. As a nice extra touch, the whole shebang is tidily packaged like the journal Indy received as a gift from his father prior to their travels. The bulk of the set’s supplemental materials are 39 brand new documentaries produced by George Lucas. Each one focuses on subject matters found in the Indy adventures. They vary in length, but average around 30 minutes each. Freed of the time constraints that shackle much of the content on the History Channel and Discovery Channel, which sometimes attempt to make mountains out of molehills in order to fill out their time allotment, the documentaries hit their mark and move on. This is a truly fantastic collection and Lucas is to be commended for putting so much effort into bringing Young Indy to DVD in such a well-rounded package. What won’t be found here? There isn’t a single behind-the-scenes featurette or Young Indy interview. Perhaps that will follow in one of the next two volumes. While it would be nice to see some sort of documentary on the making of the series itself, it’s refreshing to not be bogged down by a bunch of self-reflective material. Here, Indy and his fellow historic characters are given room to speak for themselves. With that in mind, consider Disc 12 as a capstone class. On tap is a 40-minute lecture by H.W. Brands, Professor of History at the University of Texas at Austin. If you can look past his not-entirely-natural mannerisms, he does a nice job of tying together a number of the threads presented during the Indy episodes and recapping the environment in which Indy lived. Among his subjects are the introduction of global standard time zones, Roosevelt, Edison, Einstein, Freud, Picasso, and Besant. Another feature on Disc 12 is an interactive video game called Revolution. Players take on the role of young Indy as he goes on his Pancho Villa adventure. The game advances and players earn game cards by answering relevant trivia questions. To help answer the questions, Indy can refer to his pocket guidebook. This one’s good for younger fans, but will probably be a bit tedious for others. Oh, but wait a minute now, Junior. The disc also includes some phenomenal DVD-ROM features. There’s young Indy’s journal, which covers material in all three of the DVD volumes and is chock full of his notes, video clips, photos, biographical information, cross-references to related documentaries, a bibliography of related books, and Internet links for further online research. In addition to the journal, there’s a world map which serves as an alternate way of navigating through material in the journal. But it also offers much more, including historical highlights beginning with July 1, 1899 (Indy’s birthday), through 1925. To simply call this part a truly extraordinary piece of work is an understatement. A more apt description is to say this is the kind of stuff that would make even Henry Jones, Sr., turn giddy. And we all know “Attila the Professor” was never giddy, even when he was a schoolboy. The picture quality is gorgeous, presented in the original TV aspect ratio of 1.33:1 (the series was, after all, produced in the pre-high-def days). This isn’t a simple port of those old VHS versions, although it is a little weird that not once during the entire set is the original, broadcast-edition Young Indiana Jones Chronicles opening titles sequence ever used. As for the audio, it’s available only in the original 2-track stereo. Surely George could have remastered the soundtrack to full-blown 5.1 surround. But, in the grand scheme of things, that’s a merely a quibble. With a journal at the ready, watch Young Indy do his thing and take notes. Then go out there and see the world firsthand. For a little more preparation, the best advice is to simply pick the documentaries that interest you and check out the others for some extra educating. A couple recommendations are the documentaries about T.E. Lawrence, George Patton (two personal favorites) and Annie Besant. The Besant documentary is found on Disc 7, which is a doozie that also includes documentaries about Jiddu Krishnamurti, Chinese medicine, and Eastern spirituality. The latter also features enlightening comments from Deepak Chopra. Honestly, there’s a wealth of good material here and treasures abound throughout the set. The documentary about Edward Stratemeyer is revealing, the Patton segment includes an interview with his grandson, Robert H. Patton. The documentary about invention and innovation features Dean Kamen, the inventor of the Segway scooter and a wheelchair that can walk up stairs. There’s something to be learned at every turn. Also check out the lecture by H.W. Brands. It succinctly packs a lot of information into 40 minutes. But above all else, be sure to go to Indy’s journal and explore some more. It’s terrific.